Whether you are just finishing up your bachelor's degree or have a PhD and years of experience in academia, making the transition to an "alternative career" in the non-academic world can be intimidating. There are different expectations and rules, and no road map... until now. In Navigating the Path to Industry, an industry veteran with more than 10 years' experience as a hiring manager gives you the inside scoop on how to find your new path and get a job. Give the ebook as a gift! A printable gift card is available from Gumroad. Finding a job is hard. Running a non-academic job search when all of your previous experience is in academia is even harder. This book won’t make it easy (unfortunately, nothing can do that), but it will help you learn to run a successful job search and avoid common pitfalls. It provides a hiring manager’s advice on networking, conducting informational interviews, converting your curriculum vitae into a resume, writing a cover letter, interviewing, and maintaining your self-confidence throughout the job search process. 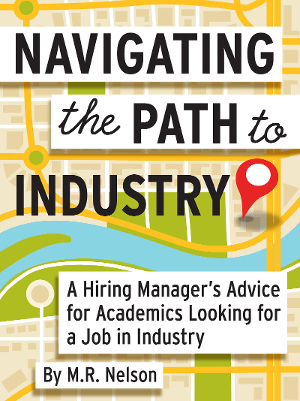 This concise collection of job searching advice provides a framework for finding the way out of academia and into a new job for academics at all levels who have realized that they want an alternative career. Read an excerpt about informational interviews. M.R. Nelson is a manager of people and projects in the biotechnology industry, specializing in the intersection of science and information technology. She has more than ten years of experience as a hiring manager, and a Ph.D. in the biosciences. She is also the author of Taming the Work Week: Work Smarter Not Longer, a short ebook about improving personal productivity. You can find her online at BeyondManaging.com or on twitter: @melanie_nelson.